In this fun and interactive Math Magician Game, you can help the magician by correctly solving addition, multiplication, and subtraction problems. Make 20 bunnies disappear by dragging and dropping each bunny into the correct basket. This fast-paced game provides students with a fun way to practice addition, subtraction, and multiplication facts. The game can be played on computers, iPads, and other tablets. You do not need to install an app to play this game on the iPad. 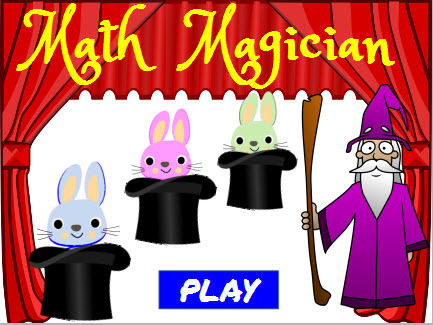 Return from this Math Magician Game to the Elementary Math Games webpage, or to Math Play.